Whenever mikrotik is mentioned the first thing that comes to the mind of a wireless or data communication engineer is always the winbox application. · Connect to the internet. first step in configuring every mikrotik radio is by downloading the winbox here and then lunch the application, which will pop a login interface. Click on the three doted sign (…. ), on the right to bring up an interface to display option whether to use mac address or IP address to log into the radio for this example am using MAC address to login for the first, so click on MAC address number, click on login, using the default IP address 192.168.88.1, password is empty until you password the radio. Step 3 : Do system reset, by going to new terminal then type system reset, a dialog option will appear type in yes. then click on Remove configuration to start a new configuration. Step 4: Click on identity to establish a name for your radio and then click apply and OK. Step 5: Click on IP, >>> click on address. click on the plus sign, to add IP address, and network address click on apply and OK.
step 6 : click on SNMP .>>> click on enable and apply. 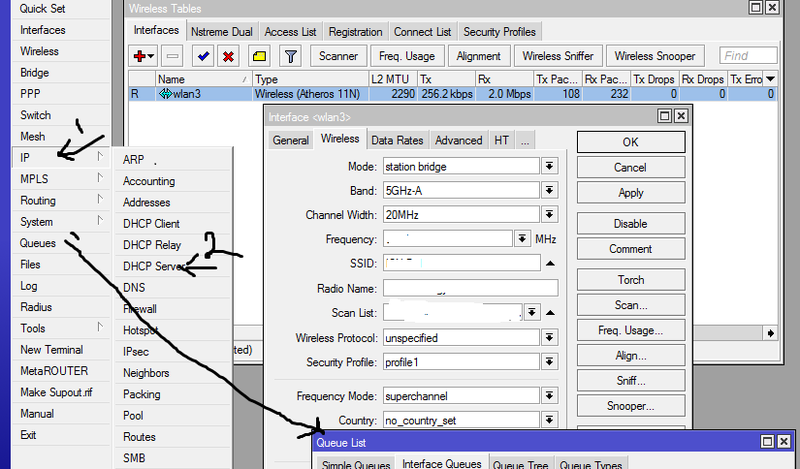 step 7 : On top of the list click on wireless, click on enable to add Wlan and then double click on the to input your radio frequency, frequency scan list, mode ap bridge, channel width 20 MHz, band should be 5 GHz, wireless protocol should be change to nv2 or any, security profile, antenna mode, bridge mode should enabled. 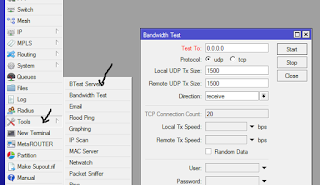 step 8 : click on advance on the lower dialog box on wireless, change the frequency mode to super channel, click on apply and OK.
step 9 : click on IP>>>> click on route >> click on the plus sign, click on Gateway, then add Gateway IP, that should be the ISP gateway IP. step 10 : click on New terminal type in import file to import you security files to avoid your user longing into your radio. click on system to add password, to secure your radio from your clients end then click on apply and OK.
Click on IP >>>> click on DHCP server to configure DHCP and then click on network to lease out DHCP IP’s and DNS address. click on queues to queues your client to their subscribe bandwidths. Name queue 1, target then input the bandwidth here. Now that we have seen our network and connect to then let us do a bandwidth test and also run a ping to the internet to see what we have. 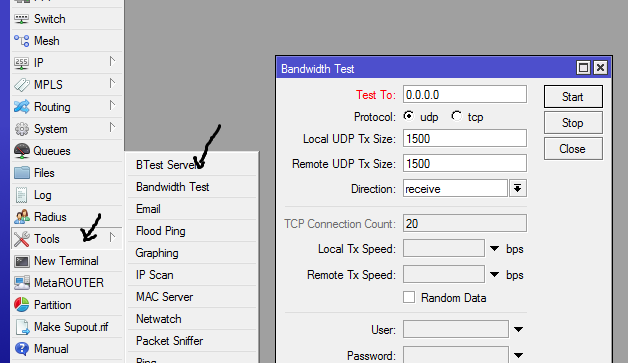 to ping just click on tools and then click on ping and then ping, to your desired IP like 8.8.8.8 etc. 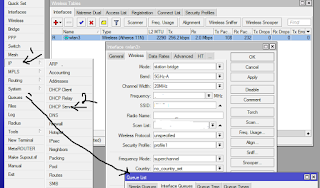 This post is just about the simple way, a mikrotik outdoor radio can be configured, using a winbox application, meanwhile what I actually did here is an initial configuration although we were able to ping the internet after we Nated our IP, but there are much more to do when it comes to mikrotik, which include proxy settings, MPLS and creating of tunnel which I hope will definitely come your way on this blog soon but before then use these ideas for your basic configuration and then success will be knocking on your door like never before. finally your will observe that the configuration setting between mikrotik router board 411 and 433 is just about the same. ← How to Activate Your ATM Card For Electronic Transaction.